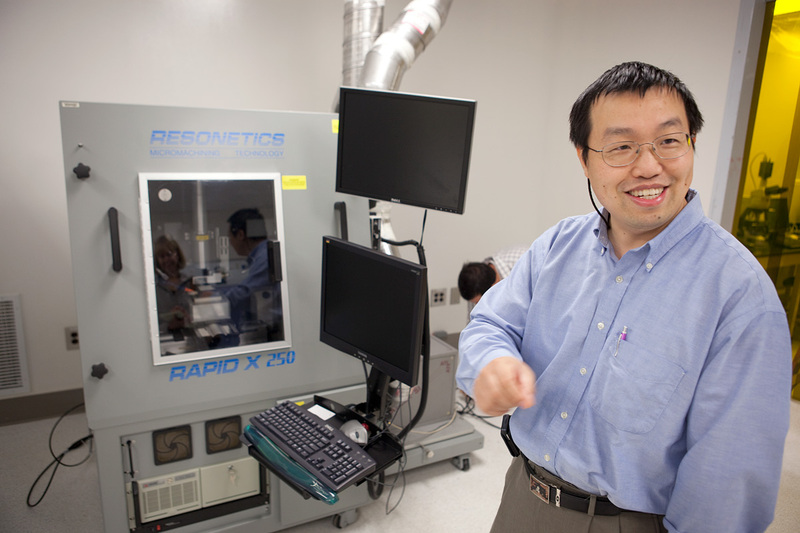 Yiping Zhao is a professor of physics in UGA’s Franklin College of Arts and Sciences. Athens, Ga. – Researchers at the University of Georgia and their collaborators have developed a new technique to enhance stroke treatment that uses magnetically controlled nanomotors to rapidly transport a clot-busting drug to potentially life-threatening blockages in blood vessels. The only drug currently approved for the treatment of acute stroke—recombinant tissue plasminogen activator, or t-PA—is administered intravenously to patients after the first symptoms of ischemic stroke appear. The protein in the drug dissolves blood clots that cause strokes and other cardiovascular problems, like pulmonary embolisms and heart attacks. By collaborating with their medical partners, the researchers tested their approach in mice that mimic blood clots in humans. Once a clot was formed, they injected a mixture of t-PA and a small number of magnetic nanorods only 300 nanometers in diameter. By way of comparison, a single human hair is about 80,000 to 100,000 nanometers wide. Upon entering the bloodstream, the nanorods are activated by two revolving magnets, which make the specially designed particles rotate not unlike a series of small fans, pushing the drug to the site of the clot. Stroke is the second leading cause of death worldwide, according to the World Health Organization, while the Centers for Disease Control and Prevention estimates that one American dies from stroke every four minutes. “We’re dealing with a huge population of patients who desperately need new treatments,” said Leidong Mao, paper co-author and associate professor in UGA’s College of Engineering. One of the most significant risks of t-PA treatment is uncontrolled bleeding. While the drug may successfully dissolve dangerous clots, it also temporarily prevents the formation of clots throughout the body, making patients vulnerable to hemorrhage. The research team plans to continue its investigation using nanorods made of new materials that are more compatible with the human body, but they caution that these results are preliminary, and more research must be done to perfect the technique. “We also want to develop a chemistry model to illustrate the relationship between clot dissolving speed and other experimental parameters,” said Weijie Huang, graduate student in physics at UGA. Other authors on the paper include Lijie Huang and Kunlin Jin, University of North Texas Health Science Center; Bo Yang, University of Texas; and Qichuan ZhuGe, Wenzhou Medical University. For a full version of the paper in ACS Nano, see http://pubs.acs.org/doi/full/10.1021/nn5029955.